I was thinking about setting up a friend, but I needed to do some reconnaissance. I asked our mutual friend what type of guys aforementioned friend usually goes for - frat boys? "No, I think she used to like frat boys but now she's trying to move away from that." OK, but what other sorts of guys are there? 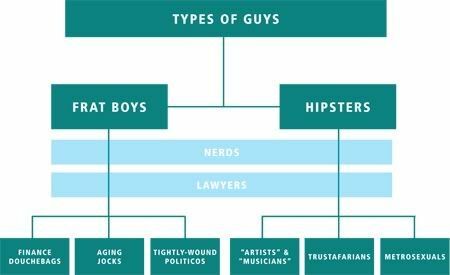 And then it struck me: There are only two types of boys our age (20 - 30). I put together an org chart for illustrative purposes. You're either one or the other. Of course, within those types you have your various subsets. My friend and I brainstormed a few. This is by no means an exhaustive list. November 13, 2009 by Adele Chapin.